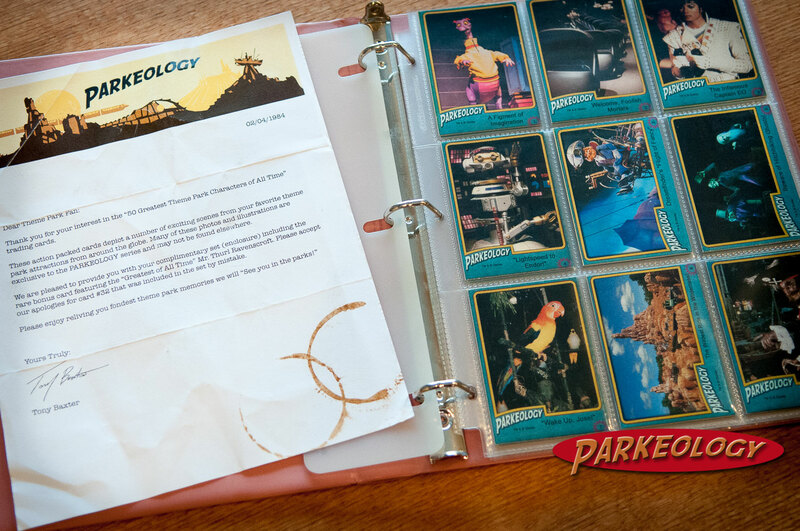 Two months ago Parkeology unleashed what is indisputably the most popular series about possibly fictional 1980’s vintage theme park trading cards ever to appear on the Internet. In fact the response has been so overwhelming that it is perhaps only rivaled by our explosive expose on Martin Short. In case you somehow missed them you can start from the beginning by clicking here or catch up on Shane’s penultimate post last week by clicking here. This welcome letter may in fact be even more rare then the cards themselves! We have reviewed many original park characters, some famous, others infamous and a few pretty much unknown and now we have finally made it the end of the line. Much like the cards themselves it is extremely unlikely that a series two will ever be produced, in other words this is it! Today’s group is a rag-tag band of misfits to say the least. They span four parks, two continents and decades of time. They share nothing in common other than being on this list and yet there is one very special surprise. You see the list is not actually 50 characters but 51. 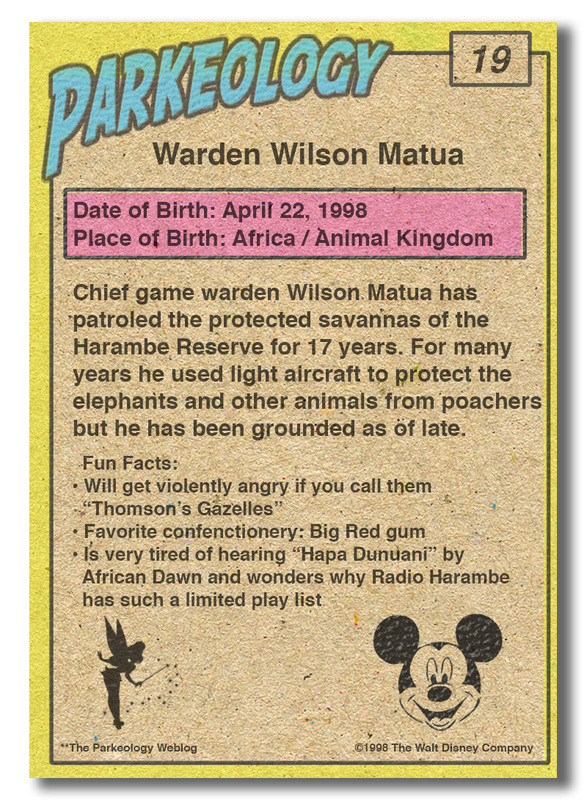 There is always that one ultra rare “bonus” or “chaser” card and I am proud to say that we have it and I think it is in fact the single greatest park contributor of all time… but more on that later. 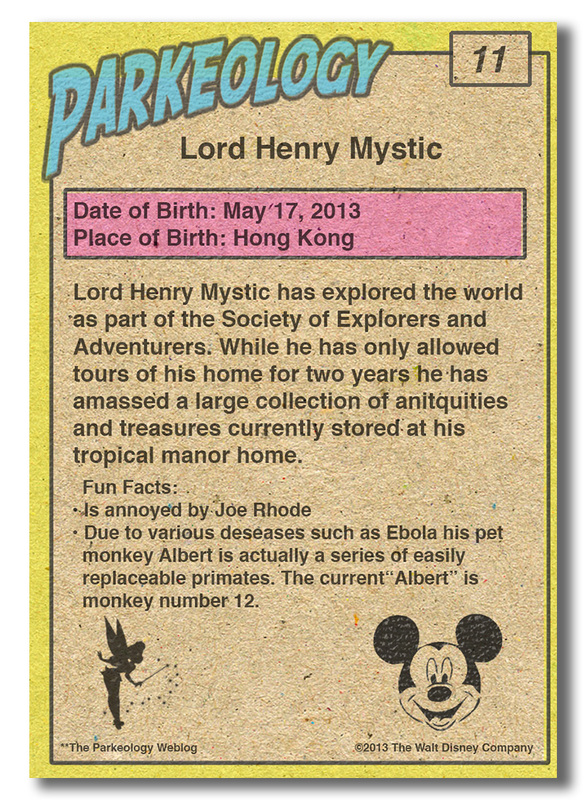 The first card up is Lord Henry Mystic from Mystic Manor in Hong Kong Disneyland. Lord Mystic shares much in common with his fellow 50 Greatest list-mate Harrison Hightower but is much more benevolent and animated in his appearance. 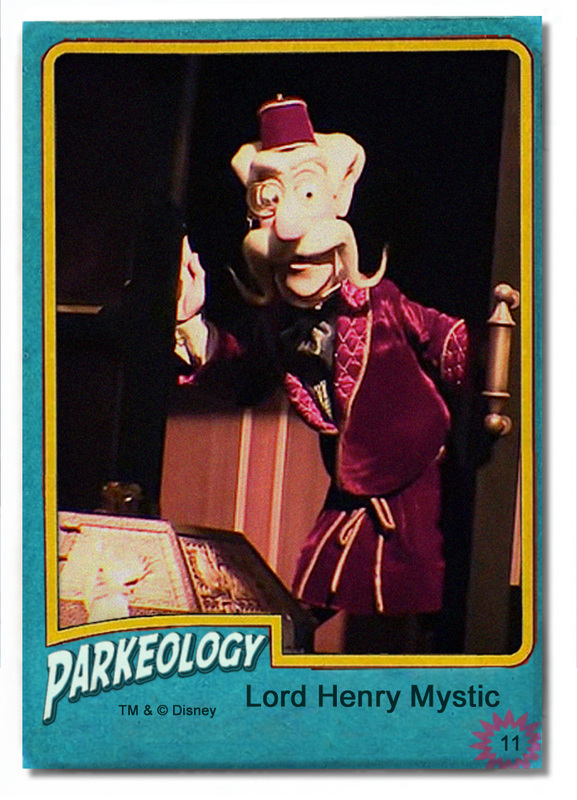 Mystic Manor can be thought of as the spiritual cousin to the Haunted Mansions found in other Disneyland parks and Lord Mystic is the final character from an overseas park to make the list. Coming back stateside our next character has had his role slightly truncated in recent years but is still a key player in the marquee attraction at Disney’s Animal Kingdom. Keeping an eye from above. 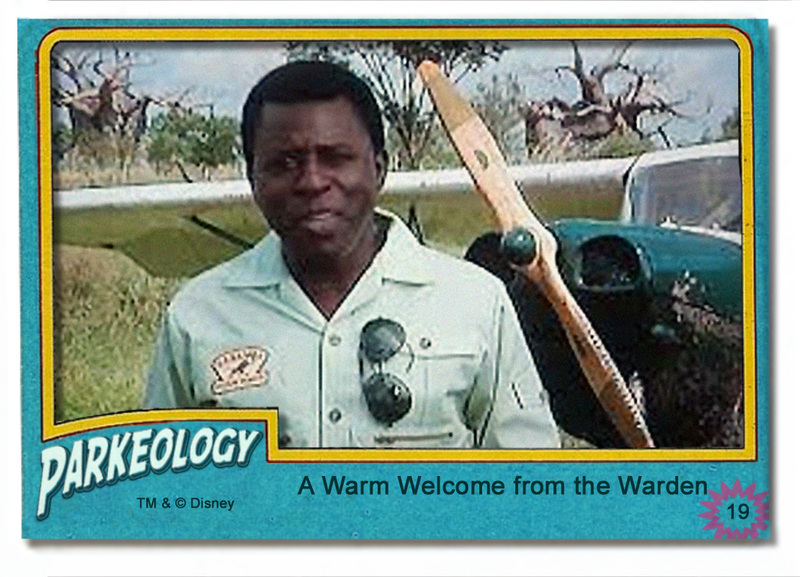 Warden Wilson Matua is always ready to greet guests to the Harambe Wildlife Reserve with a warm smile and a sincere message of conservation. He is our “eye in the sky” as he used to patrol the reserve via light aircraft. Warden Matua used to have a guest on his plane; Miss Jobson. While she did not make our list Mr. Johnson did. Mr. Johnson never sent anynone to the moon but he sure looks like someone who may have. 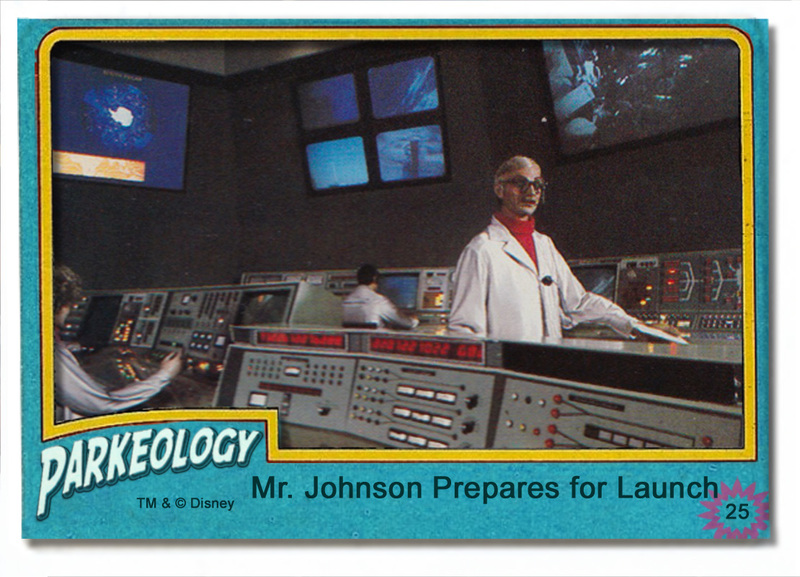 Mr. Johnson was in charge of mission control for risky Missions to Mars. He worked parks on both coasts and was a cult fan favorite. 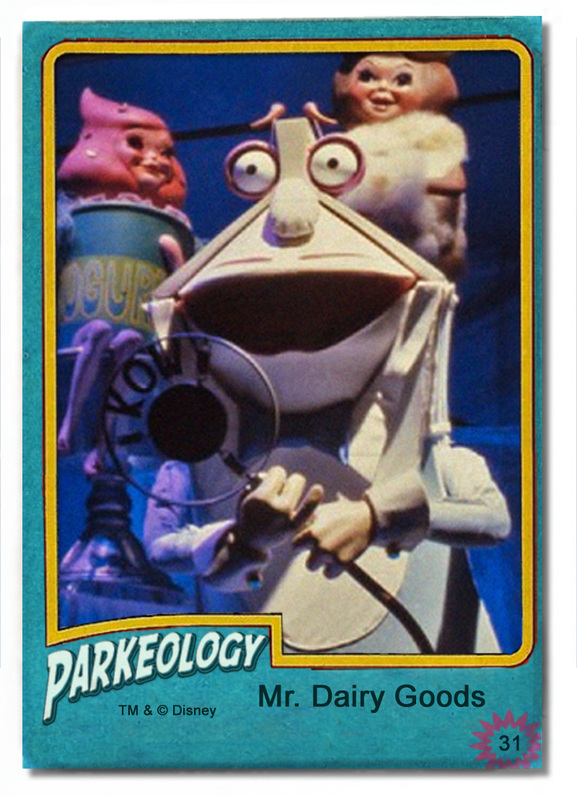 Speaking of cult favorites our next character was my personal favorite from the long defunct Kitchen Kabaret from Epcot’s Land pavilion. They really don’t make them like they used to. Mr. 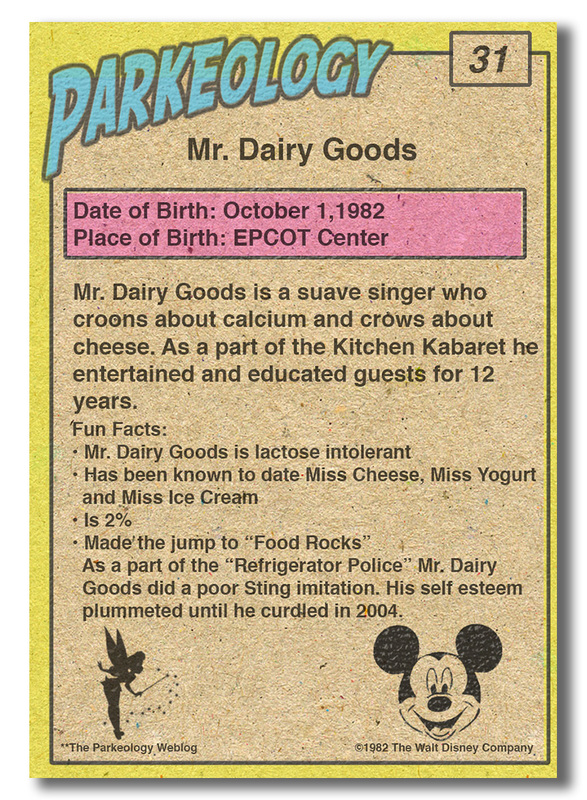 Dairy Goods did make the jump to the far inferior show that replaced the Kitchen Kabaret (Food Rocks) but if you wanted to see him at his peak you had to visit 80’s EPCOT Center in all it’s original glory. And now we hit the last entry on our list not including the special bonus card. A great 8 for 1 special is going on. This card is another slight cheater in that it has not one but actually 8 characters! 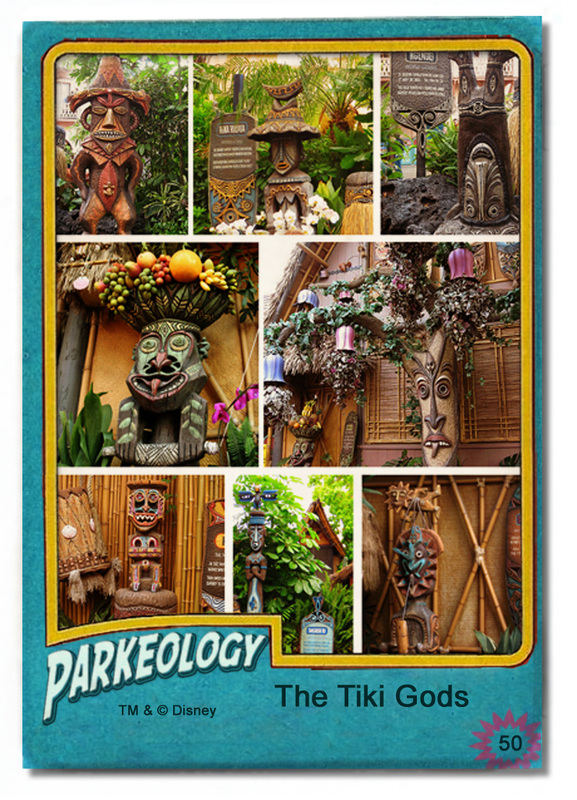 The Tiki Room Gods from the original Enchanted Tiki Room have withstood the test of time and are as beloved today as they were 50 years ago. As I mentioned earlier the creators of these cards (whoever they may be) managed to really keep an ace up their sleeves. There was one major Disney park contributor who was conspicuously absent from the list. When these cards first came out I recall being very concerned about this obvious omission and then it was finally revealed that he was reserved for what must be considered the single most important card in the series. The unbelievably rare (there are only two known examples) bonus “chaser” card features a man who not only has the coolest name ever but also has made a massive impact on pop culture both inside Disney and out. 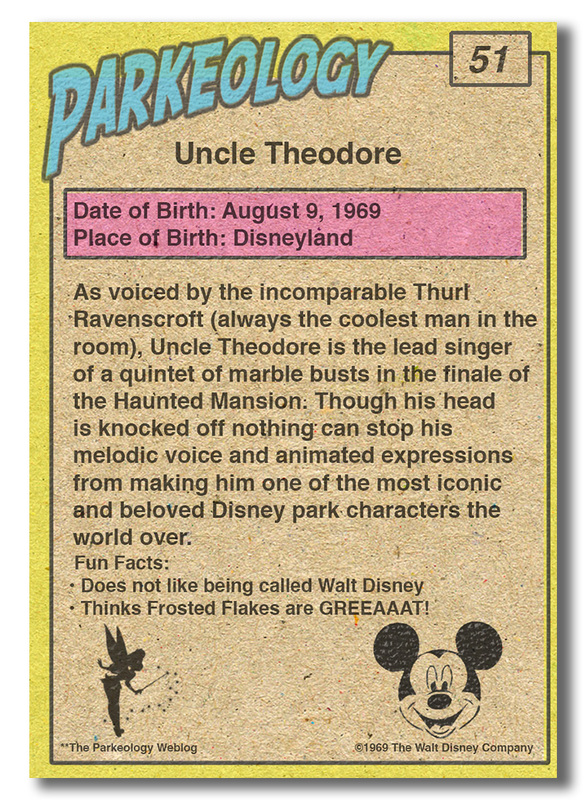 While Thurl Ravenscroft is depicted here as only one of a multitude of impeccable, brilliant and memorable park characters (Uncle Theodore), if the truth is told Thurl had previously landed on our list. He gave such widely diverse performances as Tony the Tiger and is loved by all as the singing voice of the Grinch who Stole Christmas. Throughout the years Thurl contributed to the parks in immeasurable ways. Buff from the Country Bear Jamboree, The Enchanted Tiki Room (Fritz), the classic Pirates of the Caribbean, The Disneyland Railroad, the Mark Twain Riverboat, Splash Mountain and the Sailing Ship Columbia. More than a mere song and dance man or some silly grimacing stage clown mugging for applause he was a quintessential entertainer. Surely Thurl was a legend among Disney legends. He was in fact there on opening day ushering in the opening of Sleeping Beauty Castle. He lent his voice to a who’s who of characters; everything from big classic movies like Pinocchio and Alice in Wonderland to Kirby from The Brave Little Toaster. It is abundantly clear to see that Thurl Ravenscroft is a spectacular finale to our list of the 50 greatest of all time. And on that very appropriate note we will carefully file away our cards back into their protective archival sleeves, snap them into acid-free binders and place them back on our temperature controlled shelves for another generation to discover one day. We love these cards, it is a real shame that they never found a wider audience and ended up lost in oblivion; there is just no accounting for taste I guess. Thanks for hanging in there… all three of you who made it to the end! Did we errrr I mean the original creators of these cards miss anyone? This entry was posted in Theme Park Life and tagged Lord Henry Mystic, Mr. 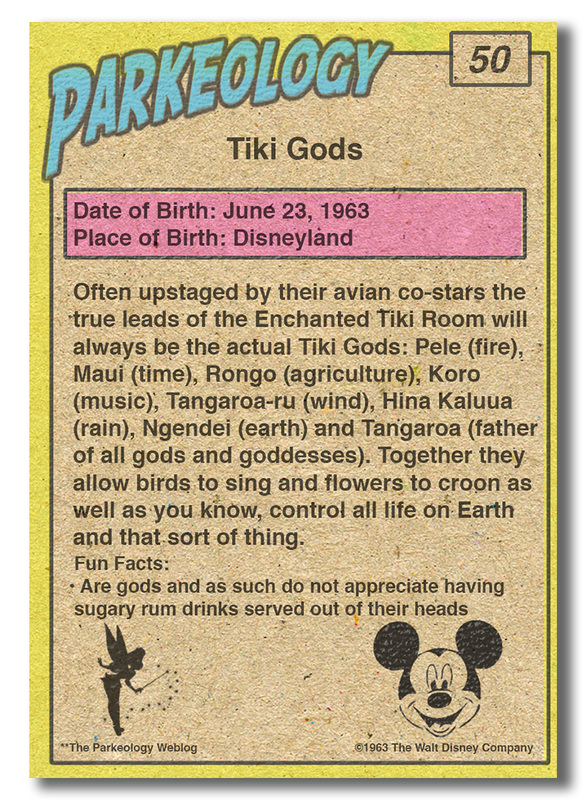 Dairy Goods, Mr. Johnson, Thurl Ravenscoft, Tiki Gods, Trading Cards, Warden Wilson Matua. Bookmark the permalink. As others have said it was just fun to get regular updates from you guys. Thanks so much for this very entertaining series. It was a treat to get such frequent posts here on Parkeology. This site is consistently one of the very best! Thnks Melanie… we appreciate the feedback and kind words, it;s always nice to hear that people enjoy what we try to do. What about the weeping “cockodrill”?! I nearly push people out of the way to see that beaut! There are so many great ones Suzy that it must have been nearly impossible for the creators of these cards to narrow it down to 50. Yes the crodile (who I still don’t think is actually weeping)is a solid choice but I think Trader Sam has to be the face of the Jungle Cruise. If Wally Boag (which, I’m guessing, is T. Baxter’s fav because it’s #32) can be the title of a card, why can’t famed naturalist, John Muir? Listen, we didn’t create these cards so your guess is as good as ours as to the originators intentions. I can tell you this much though… I totally agree that Wally Boag as a card makes no sense! “Wally” is not a character but my guess is that one of the creators (a stubborn one) refused to listen to the other one and went renegade and just did whatever the hell he wanted with total disregard to the conceit of the cards to begin with… but that is just a guess mind you. Also I think you need to take a closer look at that letter, it appears to me that Tony Baxter (or T-Bax as his friends call him) is actually apologetic that card #32 even slipped in the set at all. Finally, in a very National Treasure sort of way there is a hidden message in this very post that conveys some thoughts about one Mr. W. Boag… but I doubt that you can find it. Well dang. I can’t find the hidden message – other than the misspelling of “Disneyland” to “Dinseyland”. Was there a reissue of that card which makes the original super valuable? These things are riddled with misspellings, clearly the creators of these cards did not do a good job proof reading, of cousre they did nto have spell check in the mid 80’s either, but no that is not it. Go to the section of text directly below the back of the special Ravenscroft card… then look down the left hand column of text. The first three paragraphs there, if viewed properly, have a secret message. I have the screen as wide as it will go and I cannot make out any secret message, so one of three things is preventing me from seeing it: 1. It is not formatted correctly on my screen to see it; 2. I am mentally deficient; or 3. You were smoking something when you wrote the post. I haven’t been this frustrated since I took my kid to the dentist last week and couldn’t find all the hidden pictures in the Highlights magazine. Im not sure how my previous response ended up in our new post instead of here but oh well. It’s no great thing Greg, more of an inside joke but I’m not sure how it is possible for you to miss it. The first word is “Wally”. If you read down the left hand side (only use the first letter of each line) you should see it. You don’t need a giant monitor but it will not format properly on a phone or tablet. A little disappointed that the Hatbox Ghost and the tree from Maelstrom didn’t make it. However, how could Duffy have been left off the list? 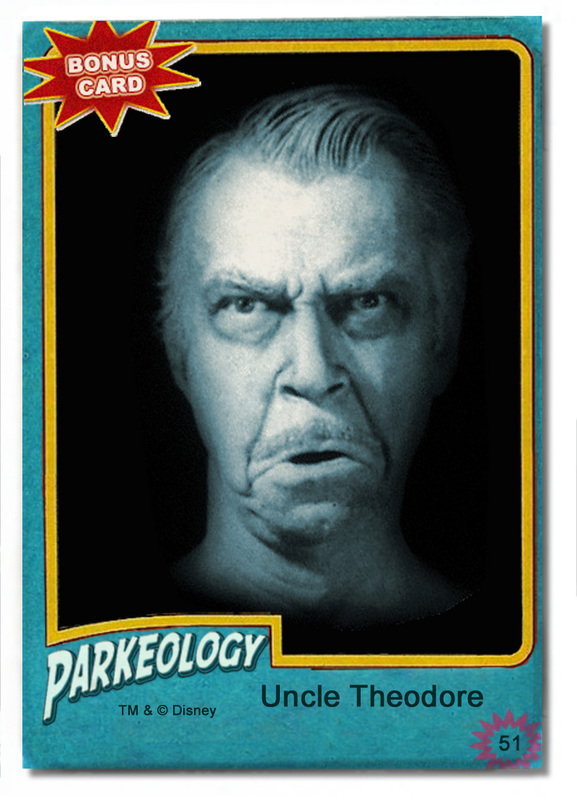 (If Disney had the foresight to include a card with Patrick Wharburton on it in the 80s, surely they could’ve included one with Duffy.) No other character has had as big an impact on the Disney Parks as Duffy. Nothing screams Disney Parks like a character specifically created in order to get parents to part with more of their hard earned money. Entertaining series. Appreciate the time and effort you guys put into this blog. I have a gut feeling that the Hat Box was left out simply because Mansion already had three cards. Truth be told virtually every single character from Mansion could carry his or her own card. As far as Duffy goes: eh… Annoying characters must not have excited the cards creators.